Congratulations on your new puppy — now the fun begins! Training should start the moment the puppy comes home. The earlier you begin the training process, the better. Immediate socialization with people will ensure that your pup will be friendly and outgoing, not fearful and shy. Start first with adults. Then, when Puppy masters this, move on to socializing with children. Have bits of kibble or treats on hand for your guests to feed your puppy. Learning to respect people, especially children, is critical for puppies. Since puppies have short attention spans, more complex training should wait until around 12 weeks of age. More intense training is best suited for dogs at 6 months of age — a great time for puppy school! 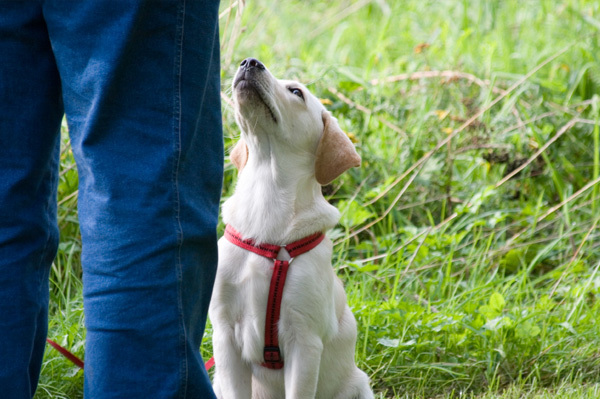 Luring your puppy into position with treats is the best way to start the basic commands. Hold a treat at nose level, then lift the treat up a bit to lure him into sitting position. Then, of course, praise and a treat should follow immediately. Try luring him into the down position by moving a treat all the way to the ground. Your puppy should follow to investigate. Again, praise and treats! Try enticing him into stand and then come. Depending on your puppy’s ability to focus just teach “sit” for a few minutes or try two commands if your pup can handle it. Remember to keep training sessions short and sweet — anywhere from 5 to 15 minutes. End the session before any fatigue or frustration sets in for either of you. Also, try to close with a positive command that your pup has already mastered, so everyone walks away happy. In the professional training world, opinions differ on the best ways to train. Most believe positive reinforcement is the best approach. Punishing bad behavior may work at times; however, negative feelings on both sides can build. Having a puppy should be an enjoyable, satisfying experience for all. Reward good behavior with treats, praise, toys or playtime. Don’t necessarily punish bad behavior; just ignore it and wait for some good behavior to reward. The key is to pay constant attention so those good moments do not go unrewarded. Precise timing is crucial in rewarding dogs, who absolutely live in the present. Many professional trainers find success with clicker training, which uses a small handheld device to make a loud, clicking noise. This sound is immediately followed by a treat, and eventually the dog associates the click with a reward. Advantages to clicker training are clear-cut communication with your dog and faster response times to good behavior. When teaching new tricks, try breaking them up into smaller parts, rewarding your pup for each tiny step achieved. As with children, a puppy that exercises is easier to work with and is much better behaved. Consistency is paramount. Puppies get confused if commands are said differently in training sessions. Tell all family members to use the same words and phrases. Make your dog work for everything — meals, bones, walks and even a belly scratch. This teaches manners and shows her who is in charge.